For days now, I’ve been scanning the ground when I’m outside, watching the slowly growing shoots of green for signs of that first spring bloom. This is a ritual I’ve kept since childhood, when I would jump off the school bus each spring afternoon and scamper down the driveway to my mother’s flower garden, peering into the neat tangle of perennials just starting to brighten from winter brown to green. There was a small cluster of crocuses planted there, in Easter shades of purple and yellow and white. When the first one finally burst through and opened its dainty cup to the strengthening sun, I knew spring had arrived. Some people, with drier, warmer garden beds than mine, have already spotted their first blooms this spring. Alas, while the snow has melted from our perennial garden, I think the one crocus we had has drowned. It seems I’ll be waiting awhile still for the first sunny burst of yellow daffodils, which will fade away to deep purple flag irises, feathery pink astilbe, and buttery gold Stella D’Oro daylilies. While I wait for the flowers, I have turned my attention to the vegetable gardens, tending to the compost heap, which was neglected all winter, and tilling last fall’s layer of leaves into the dark, wet dirt. The big garden out back of the house is still too soggy to work much. But the two smaller beds in the side yard are well-drained and ready for planting. Into one of these this week we sowed our first crop of peas, dropping the small, dried spheres into the warming soil. My children happily paused from their sandbox play to help set the wire fencing that will serve as pea trellis, then place a handful of seeds into neat rows. We all love the feeling of digging fingers into yielding earth, and we can nearly taste the sweet peas that will grow on the vines that sprout from those seeds, climbing slowly upward, then swelling with pods that we’ll break open for the sun-warmed treasure inside. We’ve planted cherry tomato plants and cucumbers into pots inside, leaving them in the sunny shelter of the big window to soak in the warmth. The children check on these pots each day to see how the seedlings within have progressed. But this is not the same as digging in garden dirt, tilling the soil by hand, etching straight rows to take the seeds, carefully patting the earth above them. So we have planted the first seeds of hope for a garden this year. And as the snow has receded, we have rediscovered some of our warmer weather activities – bike rides down the lane and walks through the woods road to the brook, where the children toss sticks for the dogs to chase. In our early spring ramblings, we have encountered all sorts of lichen and fungi, puff balls that smoke spores when touched, squirrel middens under tall hemlock trees, and a place on the big boulder out back where some animal scraped away thick moss in search, we think, of a meal. Still, we are waiting for that first bloom. It might come with the daffodils, which creep higher each sunny day. But sometimes we find the first spring flowers in the wild – bloodroot peeking from beneath the crooked old apple tree by the clothesline, or marsh marigolds growing in bright patches along the brook, or trilliums and trout lilies pushing through leaf litter along the roadside. While we wait, we’ll keep turning the soil, preparing for the long, hot, growing days of summer. And in the fall, after the vegetables have been harvested and the perennials cut back for winter, after I’ve turned the soil for the last time this year, I’ll try to remember to plant some crocus bulbs in the patch of garden by the living room’s big window, where the sun hits early and stays all day. That way, next year, we won’t have to look so hard or wait so long for the first bloom of spring. Original content by Meghan McCarthy McPhaul, posted to her Blog: Writings From a Full Life. This essay also appears in the April 25, 2014 edition of the Record-Littleton. My daughter, who is 7 years old, has started writing poetry. 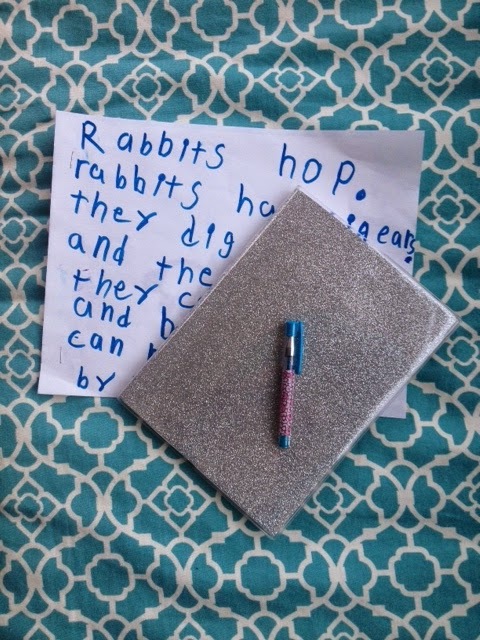 This new interest seems to have grown from a poetry project in her first grade class, in honor of April being National Poetry Month and in preparation for the school’s upcoming Poetry Night. There is a history of poetry here, of course. The White Mountains, and the forests and fields and villages around them, have inspired countless writers and poets, including Robert Frost, who lived for a time down the road from where I live now. My daughter’s recent poetry, not surprisingly, is inspired simply by the happy thoughts of a 7-year-old. So far, she has waxed poetic about rabbits, dogs, cats, and the month of April. In one poem, she combined all of those things: April rabbits/April dogs/April cats/I love them all. Sometimes she writes her poems into big hearts she’s drawn on the page. She likes to use her new sparkly pen and write in her new sparkly notebook. She is a girl who loves to throw a little sparkle into everything she does. Before my daughter wrote poems, she wrote books. These tended to center around seasonal themes – the bats and ghosts and witches of Halloween, the sand and seashells of a summer trip to the ocean. When she feels like writing, she sits down within the lively din that is nearly constant in our house, touches the end of her pencil (or pen) to the side of her mouth, opens to a new page, and just starts writing. I love that my daughter writes. In this, she is like me. I have loved to put words on paper since I was old enough to climb the tall pine tree in the backyard of my childhood home and sit there with my notebook, surveying my world, thinking thoughts, writing some of them down. In many other things, my daughter is quite different from me. She has, for instance, this confident sense of style that allows her to pair patterns and colors and textures that seem outlandish, but somehow work for her. While she struts like a fashion diva, I walk like a tomboy. Where she manages to always be fashionable – even on the soccer field or in the sand box – I can’t even manage to be fashionably late, preferring instead to be a few unfashionable minutes early to everything. For the first two summers after my children were born, I worked as a docent at The Frost Place, that house just down the road where the great poet and his family lived nearly a century ago. It was there that I realized how powerful, and how meditative, poetry can be. I spent many a quiet afternoon reading Frost’s poems, his words strung together in timeless lines and stanzas. I already knew “Stopping by Woods on a Snowy Evening” by heart and “The Road Not Taken” nearly as well. In those summers, I discovered other Frost poems – “Revelation” and “Reluctance” among them – and other poets. One night, there was a reading with three contemporary poetry greats: Maxine Kumin, Galway Kinnell, and Donald Hall. I don’t remember which poems they read that summer evening, but I left Robert Frost’s old barn feeling both contemplative and euphoric. That is the power of poetry. It is in song lyrics and music, in really well-written prose, in nursery rhymes and children’s books. It can be soulful or silly, graceful or gritty, straightforward or nuanced with hidden meaning. Be who you are, and the rest falls into place. Those are good words to live by, I think, words I’d like my children to heed as they find their way in the world. I don’t know if my daughter will continue to write poetry, or if this is a fleeting interest. But I hope she’ll stay true to her sparkly, fashionable, confident self. And I hope she’ll always find a bit of poetry in her life. Original content by Meghan McCarthy McPhaul, posted to her Blog: Writings from a full life. This essay appears as Meghan's Close to Home column in the April 11, 2014 edition of the Littleton Record.